Over the years, I have come across thousands of unusual and interesting antique swords and I thought that it would be good to share with you some of the best. They don’t come in any particular order of merit but check back often as I will be adding more on a regular basis. This interesting ordinary seaman’s naval cutlass was produced in large quantities for the Dutch East India Company (see https://en.wikipedia.org/wiki/Dutch_East_India_Company) in the late-18th Century and is of a type that was manufactured in Solingen, Germany from the early 1700’s right through to the 19th Century. It is a pretty scarce sword and I have only come across a few examples in many years. It is of very simple construction and consists of an iron double shell-guard and open knuckle bow, faceted pommel and turned wooden grip. The blade is slightly curved and single-edged (double-edged towards the end of the blade) and single-fullered. The blade is stamped with the VOC company motif and the date of 1787. 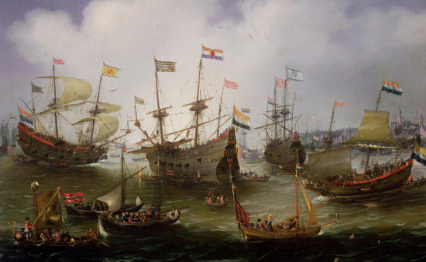 The VOC stands for Vereenigde Oost-Indische Compagnie, VOC – United East India Company – and is found on many of their swords. When I first handled the cutlass I was surprised at how light it was and also skeptical as to its effectiveness in battle as the iron shell guards do appear to be quite thin and against a heavy edged weapon, I would not fancy my chances. Saying that, it was probably a useful weapon if wielded against comparable cutlasses and would also have been light and flexible during an onboard melee. What I like about this cutlass is the simplicity of design and also the pleasing patina to both hilt and blade – thankfully, it has not been attacked by any abrasives and has retained a great age colour – this is how you want to find original antique swords but unfortunately, most have been cleaned and polished over the years – I don’t blame the original owners – swords, particularly examples with brass fittings, were rarely left alone and if it was a family sword, you wanted to keep it shiny and attractive as a mark of respect and appreciation.